Altitude range: 2500-4050 metres above sea level. Habitat and ecology: It grows in grasslands at high altitudes, on slopes of the western edge of the Andean desert. 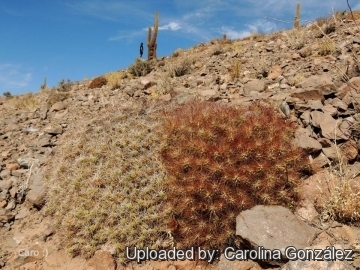 Mainly on sandy and rocky soils in close association with the local form of Maihueniopsis glomerata (camachoi) and Cumulopuntia boliviana subsp. ignescens (hystrix). There are no threats, it is abundant, it occurs in a protected area, and easily reproduces vegetatively. The species is collected as an ornamental for specialized collections outside Chile. It reproduces by seed and spreads vegetatively by means detached joints or cladodes, which can take root and establish themselves as independent individuals. Tephrocactus conoideus F.Ritter ex Backeb. Opuntia hypogaea Werderm. in Backeb. Opuntia molfinoi Werderm. in Backeb. Tephrocactus ovallei (J.Rémy ex Gay) Backeb. Description: Maihueniopsis conoidea, sometime considered a local or morphological form of the widespread and variable Maihueniopsis glomerata, differes from the latter mainly for its usually smaller segment size in small flat clusters. Throughout its natural range there is considerable variation in segment size, spine colour and spine count per areola. 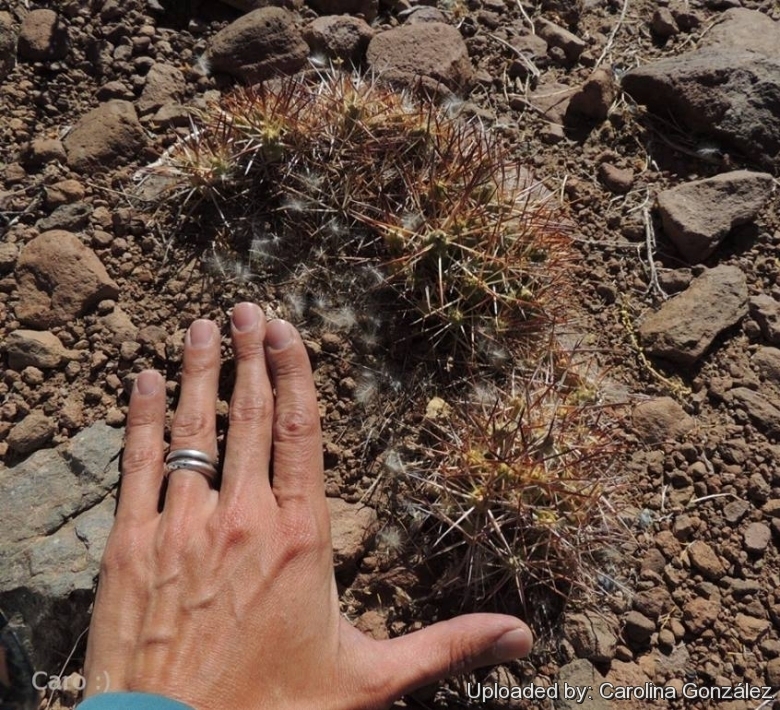 Habit: This cactus forms dense and small cushions. Stems (joints): Tapered-conical to spheroidal to 2 to 4 cm long, something sharply pointed and not tuberculate. Spines: Concentrated in upper areoles of the joint, the apex of which sometimes without spines. Central spines: 1-2 very variable, stout to bristly, long to short, up to 5 cm long flat, straight or slightly curved. Sometimes absent (spineless). Radial spines: 0 to 2, bristly. Flowers: Up to 5 cm, pale yellow. Pericarpel obconic. Fruit: Globular, large green or yellowish spineless. 2) Faundez, L., Saldivia, P. & Walter, H.E. 2013. Maihueniopsis conoidea. The IUCN Red List of Threatened Species 2013: e.T151949A579962. http://dx.doi.org/10.2305/IUCN.UK.2013-1.RLTS.T151949A579962.en. Downloaded on 17 February 2016. Cultivation and Propagation: Maihueniopsis conoidea cannot endure any standing heat and need an absolutely airy and sunny place this brings very healthy plants with a good spination and flowers, but often in cultivation the plants are rarely so compact as they are best grown inside a greenhouse because of our very humid weather in North Europe and America which gives a relatively low light intensity compared to the temperature. However, this species takes considerable frost and is certainly worth growing.